Monoclonal antibodies could recognize almost unlimited targets because their high specificity and affinity character. This ability has catapulted them as an attractive and fast-growing class of therapeutic & diagnostic agents over the past decades. Mapping the interactions between antibody (paratope) and antigen (epitope) is crucial for characterizing antibody’s mechanism of action, predicting suitable antigens, as well as securing intellectual property. A number of different approaches have been used for antibody epitope mapping, including X-ray crystallography, NMR, mutagenesis, peptide-based ELISA, hydrogen–deuterium exchange, etc. However, these methods generally require high levels of expertise and cost, or only give information on linear structures, which greatly impedes interpreting the precise nature of antibody-antigen interactions. 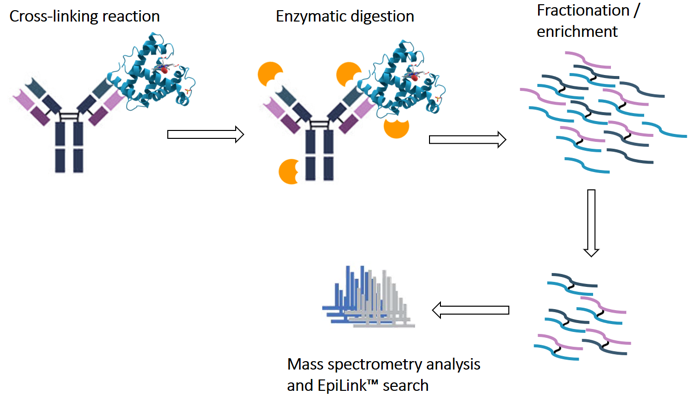 With the help of EpiLink™, we have successfully pinpointed the epitope information of multiple antibodies. Our state-of-the-art platform can be a robust tool to offer precise structural insights and support your research endeavors.